I should have known it was going to be one of those builds the day we pulled the carpet out. The car was sold as a mild restoration, everything was there, it was super clean, and it ran well. Underneath the shiny paint and glossy upholstery, hid a beast of unending frustration–rust. The previous build simply glossed over the floor pans, they had holes the size of small children (that is an exaggeration), this could derail the project for weeks, so new pans were ordered. It took about 2 weeks to get them installed, which is longer than it should take to do such a job, yet another hint at what was to come. 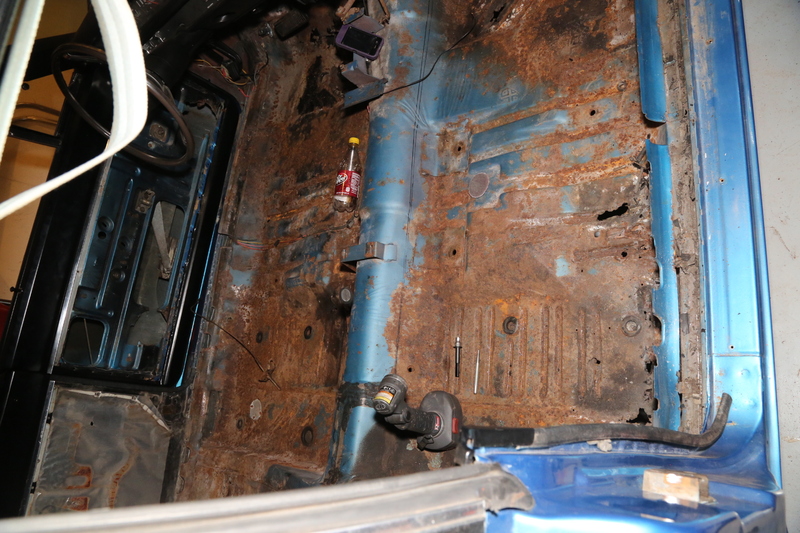 The floors looked fine from underneath the car, but once the carpet came out, oops. For the next few months, things went fairly smooth. 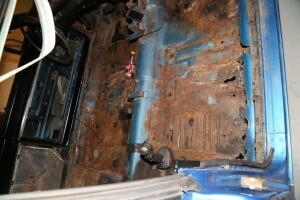 The underside of the car was prepped for Al’s Liner, a DIY bedliner that we like to use. It is clean, protects the metal from rust and lasts forever. Then we pulled the K-member. I do believe one of the Duke boys had owned this car, as the passenger side subframe rail was cracked in 6 places and the rear K member mount fell out. 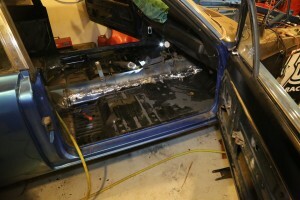 As in one of the 4 bolt plates that holds the entire front suspension to the chassis fell out. After we drilled the cracks, welded them up and reinforced the subframe channel with ¼” plate, it is now stronger than it was from the factory. But this wasn’t even close to the end of our troubles. Throughout the entire build, little things kept stacking up. The headers didn’t work with the angle-plug heads, the headers that we found to work with the heads didn’t clear the torsion bars or stock steering box. Then the brakes were shipped with 2 sets of rears instead of the front/rear brakes we ordered. The radiator did not clear the power steering pump. These things could be addressed relatively easy by themselves, but with only a couple of guys working on the car, they became larger issues, as the deadline for SEMA was rapidly approaching. And then there was the paint and body…. The new floors came out really nice. We used some repop pans for he bulk of the floor, but had to fab some pieces ourselves. Read about the Paint and Body in tomorrow’s post.